The North Coast is fast becoming the 'Golfers Playground' with courses to suit all levels. All golf courses are situated within short driving distance from Ballina so your time will be spent playing not travelling.You'll find a course to suit all levels of skill with Australian bush settings, you may even meet a kangaroo or wallaby. Ballina is a challenging par 72 course where accuracy will preside over power. 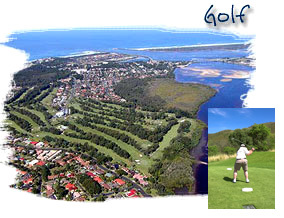 With Ballina's sloping greens and lush fairways, this course will test all facets of your game. The club's signature hole known as the 'Dam hole' is the Par 5 499m 13th, that doglegs left. A powerful right to left drive will set you up for a long iron over the dam to the green. Many a ball has come to a watery grave here. Ballina Golf club has all modern facilities including bar, restaurant, pro shop, resident pro and is open 7 days. Greg Norman won his first professional title here back in 1973 ! "Royal Teven", as it is fondly known by locals is set in the hinterland just west of Ballina. A par 31, 9 hole layout, Teven is set in a peaceful valley amongst rolling hills and gentle streams. The first at Teven will test your judgement, hitting from the top of the hill to a small undulating green below. Beware... looks can be deceiving! Teven caters for social and holiday golfers and is open 7 days. Equipment can be hired from the pro shop. Set on the back of Bundjalung National Park, Woodburn - Evans Head's 9 hole composite course is well established with towering gums, wide fairways and rolling bent greens. The koalas keep an eye on the long par 3, 2nd. Accurate long iron play will be rewarded here as slippery sloping greens will test your putting prowess.